Oliver Houck’s publications on the oil and gas industry and the Louisiana coastal zone include "Land Loss in Coastal Louisiana: Causes, Consequences and Remedies," Tulane Law Review (1983), and "Can We Save New Orleans? ", Tulane Environmental Law Review (2006). Who Will Pay to Fix Louisiana? Devastation wrought by the BP spill is in headlines daily. 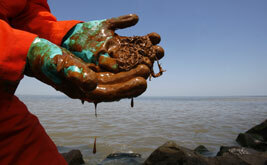 But decades of oil drilling in Louisiana have done far more indelible damage.